Sticking with the outdoor theme this week, I’m picking up from where I left the last blog way back in August 2016, when I’d been working on the decking at the front of the house. Ha! Famous last words. That decking stood proud and tall – and distinctly unfinished – for another eight months. Not my fault of course. I had a couple of extended work trips in India, and it’s a bit far to commute from Chennai for the weekend just to finish a bit of decking – for some reason my boss didn’t see that as a justifiable expense. And by the time I did finally make it home it was Winter. Nobody in their right minds works in the garden during the winter months in the frozen North. By the time my commuting had reduced to just the weekly red-eye to London and the North unfroze enough to venture outside, I’d turned my attentions to the long list of things that needed finishing indoors and didn’t really have any time for the garden. Now you can say what you like about the Scottish weather, but the copious quantities of rainfall do mean that the minute temperatures event hint at better things, everything starts growing with a vengeance – particularly the weeds. So with a relatively mild Winter (by our standards) in 2016, and a temperate Spring’17, as soon as we headed back into double-digit temperatures the garden did what uncared-for gardens normally do under these circumstances and went completely wild. So much so that as I parked up at the front one day I realised that from the relatively low vantage point sitting in the car I actually couldn’t see anything of the house apart from the roof. It was hidden by a jungle. I also realised that a couple of weeks later I was hosting a house-party that included a highly active 3-year-old who loves playing hide-and-seek. With the current state of the jungle, if she went to hide we could be seeking for days! I considered DIY’ing the path and driveway. But knowing how hard my land is to dig, coupled with the fact I was still working away from home quite a lot, it seemed like a better plan to call in the cavalry. Fortunately my helpful contractor chappie had a few days free between jobs, so he brought up a digger and ordered in the gravel. While the lads worked on the pathway I worked on the decking. Not actually too major a job since it had all been planned out and all materials bought eight months previously. It was just a case of getting out the hammer and chisel again to ‘dig’ a few more post holes. Fortunately, with a bit of decent weather for a change, we managed to get all construction finished before the house party arrived. Path dug, decking built. Just needed to get the grass strimmed and the approach to the barn would actually look quite civilised for a change. The measure of any good garden deck area is whether it’s an enjoyable place to sit and sip your G&T. Clearly I now had a pretty decent G&T standard deck at the front of the house. But it does have one major flaw – it only really gets the sun through to about 3pm. Now I can drink G&T at any time of the day. Admittedly I don’t usually put it on my cornflakes, but only because I consider that a waste of good gin. I do, however, live by the philosophy that the sun is always over the yard arm somewhere in the world, so I can legitimately sit out on the front deck at midday with my glass of G,T,ice’n’a’slice. But I’m not a big fan of sitting outside shivering whilst knocking back the clear stuff. And in Scotland, when the sun disappears, the temperatures plummet – none of those long balmy mediterranean nights up in the frozen North. We may have the light, but we don’t have the heat. Clearly I need an alternative Gin Deck that gets the evening sun. The perfect solution is the area outside the kitchen & cottage, which already had an ‘almost finished’ decking. It was another one of those jobs that was rained off at 90% complete, and I never quite got back to it. The answer? Well when you have a house-party, make sure you invite somebody who’s handy with a hammer and has a perfectionist’s eye. Not only did he finish off some of the gaps, he also took up some of the warped and wonky boards I’d put down and forced them back into straighter lines. Thank you Mr Handyman – you can come again. Inspired by all this deck improvement activity, I decided to carry on the good work after the visitors had gone. Grand plans included creating a number of individual raised beds for planting my own kitchen garden. A touch of the good life – sitting on the deck late into a summer’s evening with the scent of home-grown herbs wafting around. You get the picture….. So I now have outdoor Gin drinking space from early morning (just in case I do ever want to douse my cornflakes) right through to the late evening summer sun. All I need now is a solution for the midges……. It’s that time of year again – Happy Easter! It was this time of year, two years ago that the invaders from the South came to visit for the first time, and as I recall I was madly rushing about trying desperately to get the house habitable before they arrived. This time, when half the pack came back for another visit, I had big plans to keep them occupied – let’s explore the garden……. A long time ago, back in the dark days of building this place, I was shocked by an estimate from the builder that included an eye-waveringly high cost for removing rubbish from site. I challenged it, but he refused to budge saying that high costs of landfill needed to be covered. So in a misguided attempt to keep the costs down, I suggested to the builder that anything that was dug out of the barn during the build could be dumped on site. With a couple of acres of land available, there was plenty of room to lose the scrapings off the barn floor without impacting the landscape too much. Unfortunately this was in the days of Mr Incompetent Builder. Rather than spread the floor scrapings out across a wide area, he dumped it by the digger load in the field next to the house. When the snow fell that Winter, it looked like I had an Olympic Standard ski jump in my garden! Nor was that the worst of it. Mr I-B had also developed selective hearing when we discussed this. He decided that I’d agreed that all the building waste could be dumped or burned on site. In fact, using his initiative, he decided to turn my land into his own private landfill, bringing up the rubbish from other sites he was working on. 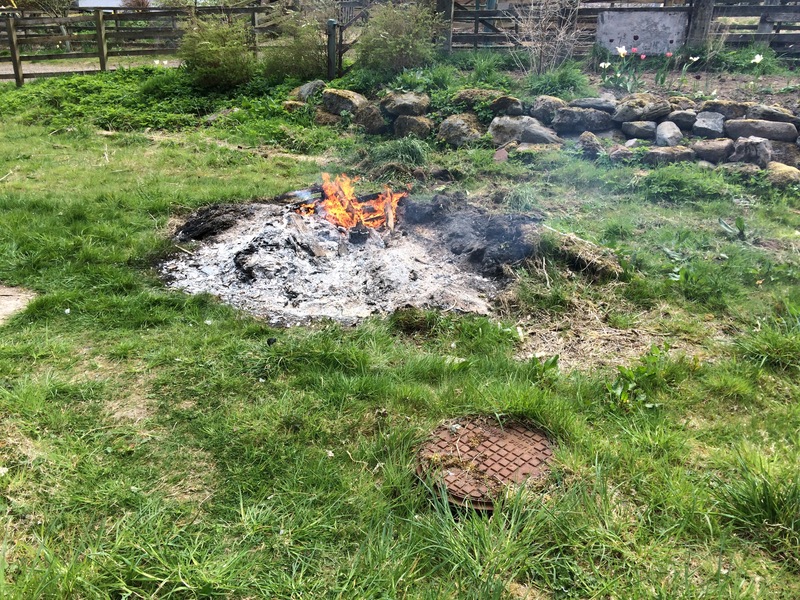 I finally caught him out when I visited the site one day to find a fire smouldering with the detritus and packaging from a Worcester gas boiler, which I was fairly confident had nothing to do with my build. a) Because at the time my barn had no floors, doors, windows or much in the way of a roof so it seemed a bit premature to have installed a boiler, and b) because the barn is too remote to be able to get a gas supply!! It turned into one of the many arguments I had with that particular builder and he eventually agreed to remove aforementioned rubbish. But did so rather unenthusiastically, and, as it turned out, rather inefficiently. But now I had a willing team of helpers – even if they didn’t know what they were letting themselves in for….! Inevitably as we wanted to work outside the temperatures plummeted and there were flurries of snow. Winter is refusing to give up this year. But hey, this is Scotland – if you let the weather get in the way of your plans, you’d never get anything done. So we braved the elements and got to work, clearing up the ‘builders yard’. Starting out in the forest, where many years ago when the forest was first planted, the saplings had been cased in plastic and staked, presumably to keep them growing straight and to protect them from deer. Forestry management hasn’t been top of my list of priorities in building the barn, so nothing has been done out there since I bought the place. The trees have grown (as they have a habit of doing) breaking out of their wrappers and leaving lots of broken plastic lying around on the forest floor. Though I hadn’t actually realised quite how many there were. The plan was to take everything down to the gate at the front of the property, and pile it up ready for dumping in a skip at some point. But it’s a fair old trek down to that gate, and with all the tree casings piling up it would have taken us a whole day to carry them all down there. Fortunately my genius baby brother came up with a cunning plan for transportation. Take one old security fence, pile on as many bits of plastic as possible, put another old steel security fence on top to keep them in place. A plastic sandwich. Of course having transported them all to the gate we needed a way of keeping them there. These things are so lightweight that one puff of wind would scatter them all over the grounds again – which would kind of defeat the object. Well a couple of bits of old rope solved that one. Meanwhile outside the forest, the lack of enthusiasm in Mr Incompetent Builder’s tidying up soon became apparent. Fencing wire, barbed wire, temporary site fencing panels, broken wheelbarrows, bricks, blocks, heat pump pipe, underground drainage pipe, aluminium sheeting, roofing lead, downpipes, gutters, you name it, we found it. Time to order that skip! The girl in the hard hat is back! Apologies if you been missing the weekly dose of chaos and crazy builder antics. It came as something of a shock to discover that I haven’t posted anything in 18 months. Truth is, my work-life-balance got decidedly out of kilter and my life was all work, via airports, hotels and dodgy BA breakfasts. Being as remote as I am, and a fair few feet above sea-level, I inevitably get a bit of snow in Winter. Whenever the weatherman glibly announces that “there’ll be showers in Scotland, possibly turning wintry on higher ground” – yep, that means me. But most years it’s not really much of an issue. The track up to the house was impassable. Until the farmer got up there with tractor and snow plough, we were cut off from the world. The snow drifted up on all four sides of the house and all seven doors into the property were blocked. Short of climbing out of a window, I was trapped indoors! Fortuitously, the day before this lot arrived I had had a bit of a mad shopping/cooking frenzy and stocked up the freezer, the wine rack and the gin store. Since I couldn’t get out, might as well just kick back and enjoy the view! That worked for about two days. Unfortunately, snow wasn’t the only problem. Temperatures plummeted (right down to -18ºC according to my neighbour). So it hardly came as a surprise when I woke up on day 3 of our snowy adventures to find there was not a drop of water to be had in any of the bathrooms in the lower part of the house. Frozen pipes! At first I assumed the water supply into the house had frozen. I have had issues in the past with the pipe freezing outside in the pump house. But when I checked in the kitchen, the cold tap was flowing freely. On the plus side, that meant the outside pipes hadn’t yet frozen. Which also meant the bathroom in the cottage was still functioning. OK, I rarely go in there these days, so there’s several inches of dust, no heating and the mice have been having a ball (they’d even eaten most of the soap?!) – but there’s also a flushing loo and an electric shower. What more can a snowed-in girl ask for? Well on the down side, somewhere inside the main part of the house it was cold enough for the pipes to have frozen, and I had know idea where. I was supposed to be heading back down South as soon I could actually dig my way out to Edinburgh, and I started to panic that there would be burst pipes and exploded joints somewhere inside the walls of the house when it all thawed out and I’d come back up a week later to find the entire house turned into an indoor swimming pool. Still, it would be a while before I made it down the road, so all I had to do was to locate and thaw the guilty pipe before I left home. I decided it couldn’t be in the roof space above the living room as, fairly recently, in an attempt to speed up/retain the hot water flow to the kitchen, I’d been up in the loft wrapping another whole roll of insulation around all the water pipes I could find. So the weak point had to be further down the house behind the upstairs bathroom wall. Before the pipes drop down to the roof space of the bothy and into the boiler room, they are effectively running along an external wall. And given the drafts that blow through the ungrouted, unsealed (and generally unfinished) tiling in that bathroom, chances are it had got cold enough behind the wall to freeze any exposed pipes. Only one way to find out. I took out the access panel behind the loo and stuck my head in to take a look. It was blowing an arctic gale! Daylight was visible under the eaves on the East wall – a nice big gap perfectly aligned to the incoming wind from Siberia. So I grabbed a large wodge of insulation and stuffed it into the gap. It didn’t seem to make much difference. So I decided I needed to plug all the way round the edge where the roof and wall meet. Minor problem – there’s not a whole lot of space back there. I think ‘contortionist plumbers’ were mentioned in that particular blog. I could barely fit myself in there, never mind a ladder. And the apex of the roof that I need to reach was about 10ft at it’s highest point. Time to think outside the box. Cue one extendable paint roller, one extendable feather duster, a roll of insulation and a reasonable amount of swearing. When insulation falls off, swear loudly and restart from step 3. Imagine using giant chopsticks while pinioned against a wall in a space less than a foot wide with an arctic gale freezing your extremities. You get the picture. I’ve never been good with chopsticks; I always ask for a fork in the Chinese! Anyway, I shoved as in much insulation as possible. It still felt pretty cold in there to me, so all I could do is wait to see if it would thaw. But hey, I still had one working bathroom and an electric shower. Why worry? Er, well, not for long. Next morning there was no water coming into the house at all. The pipes in the pump house had finally given up the fight against the Beast from the East. Now there was no alternative but to brave the elements and try to get some heat out there. The only trouble was, I couldn’t actually get any doors open. So that’ll be me climbing out of the window then. With an extension lead in one hand and a hot air blower in the other…..
….wading through a couple of feet of snow. To dig the shed door out of a drift…. Fortunately I’ve had a bit of practice at thawing out the pump house. Stick a decent hot air heater in there and after about an hour the water is usually running free again. While I was out I decided to dig out a couple of the doors so I could escape the house like a normal person instead of climbing out of the windows. But I don’t know why I bothered – by the following morning it had all drifted back again. So I gave up on the doors and had a bit of fun instead! So that’s it. My saga of the Beast from the East. Hopefully that’s the last of the Winter! Next week I promise I’ll get back to where I left off, and give some real updates on the ongoing saga that is the building of my barn…. Apologies to anyone who has been missing the regular fix of my barn building woes. Truth is, just as I’ve got to the happy state of being able to relax in front of the fire with a glass of wine without feeling too guilty about the ‘snagging list’, my job has taken me off to foreign climes. I’ve been stuck out in India for a few weeks. On the plus side, it’s a lot warmer than Scotland, and when I look at some of the wonky fittings, careless finishes and dodgy wiring that is endemic in India, it makes me feel slightly better about my marginally-less-than-completely-straight-walls! On the downside, it’s 5000 miles away from home, and even by my standards that feels a bit too far to commute just to get on with a bit of DIY…. So that’s why it’s been a couple of months since the last post. When I finally managed to escape for a couple of weeks holiday I suppose I should really have headed straight up to the frozen North to make the most of my time off at the barn. Instead I took myself off to Italy to a pole camp for a week. A fantastic week with some fantastic people. But also 4 hours of training a day. Every day for a week. By the time I got back up to Scotland my bruises had bruises, and my muscles were on strike. So I planned for a peaceful week in the remote middle of nowhere with aforementioned log fire and glass or two of wine. I’d forgotten that last time I was home I’d decided to start work on the garden in front of the house, so had ordered a load of decking. And due to a minor misunderstanding about where exactly Scotland was, it hadn’t been delivered until the day after I left the country. So it has been sitting in the garage soaking up the Scottish weather for nearly a month. Just waiting for me to come home…. So much for a lazy week. Still, it’s not like I haven’t tackled a bit of decking before. I’m a pro at this stuff, right? It won’t take more than a day, will it? Especially as this time I actually measured it properly, so the deck boards were the exact length I needed. No cutting required. So. How hard can it be? Lay out the timber. Make the frame. Dig the holes. Fix frame to posts. Drop it into the holes. Throw in a bit of Postfix. Screw deck boards in place. Have a G&T. Job done! Of course, this is my barn. I should know by now that nothing ever goes to plan….. I hate sawing wood; I cannot for the life of me saw in a straight line (probably because I haven’t got the patience to mark it properly all round) and I get bored witless after about five minutes. That’s why I invested in a bench saw. Unfortunately the timber for the posts was too big to fit under the blade, so handsawing was the only option. Luckily expert help was at hand. AKA My Dad. He may claim to be the self-acknowledged avoider of all things DIY, but he cuts a much better straight line than I do, so he got the job of chief master woodcutter for the week. Challenge number 3: The local farmer once told me he’d considered buying the barn but decided not to in the end because it had no foundations and it was built on ‘rotten rock’. At the time I’d not taken much notice, but turns out he was right. I’d forgotten that I don’t get to dig holes in garden. I mostly have to chisel them. So the process of creating 24 holes involved quite a lot of cursing, throwing of hammer/chisel/shovel/trowel, declarations of how much I hate my barn, etc. And of course took a whole lot longer than I had planned for. Challenge number four? Well the weather of course. Nobody can blog about anything that happens in Scotland in Summer without mentioning ‘rain’ at least once. Although the forecasts kept insisting we were all set for a sunny days, somehow it didn’t quite work out that way. Rain kept interrupting play. And the final challenge? Well I hadn’t really appreciated how much the land slopes away. If I keep the decking straight, by the time I get to the far corner, anybody stepping off the end would risks breaking their neck, or at the very least falling over and spilling their G&T. And since I’d rather not be sued by my guest in the future, I decided to change the layout a bit and create a split-level deck. A whole lot more work! So no, it isn’t finished. But it is three-quarters done. The rest will just have to wait until the next time I’m home! The smallest bedroom in the house – which OK, I admit, by the standards of the average British house is still a good size double – might have fantastic views out of its one window, but it is North facing, so tends to be a bit on the dark side. I’ve painted it purple (hey, I’m a girl remember), in a shade that when used elsewhere in the house actually looked quite light, but in this room seems quite cold and gloomy. So I decided it was time to lighten it up a bit. A bit of Wallpaper. How hard can that be? And of course, thanks to those countless DIY/home interiors programmes on the telly, the concept of the ‘feature wall’ has become quite trendy. So up and down the land there are hundreds and hundreds of DIY sheds, decorating shops and interior design outlets selling the stuff in reams. Which clearly means they think it is not beyond the wit of common man to do something with it. You see them in their multitudes on the Spring Bank Holiday, the handy home DIYers loading up with a trolley full of rolls of paper, paste, buckets and brushes. And a bit of mad manic glint in their eyes…. It’s not actually something I’ve ever tried. But hey, surely any idiot can slap some paste on a roll of paper and stick it onto the wall. I’m the girl in the hard hat; I’ve tackled more challenging tasks than that. In any case, I’ve got the T-shirt remember…. What can possibly go wrong? Well I do recall going to a friends house once where she showed off her newly decorated living room…..The wallpaper had more bubbles than a chocolate aero. Though admittedly she did confess that she and her partner had a bottle of wine or two before they started…. there is clearly a message in there somewhere – alcohol and wallpapering aren’t a good combination. So in the interests of doing the thing properly I put aside my bottle of wine and went out and bought myself a handy little ‘Wallpapering kit’ that had all the necessary tools – large paste brush, large pair of scissors, sharp blade for trimming the edges, and a plumb line. A bucket of ready mix wallpaper paste and we’re all set. Now if it hadn’t been included in my handy DIY kit, I probably wouldn’t have bothered with the plumb line. I mean it’s surely not that hard to tell how straight something is by eye, right? Well maybe not in most normal houses. Most weekend DIYers are probably heading home from B&Q to a house with nice straight flat walls. You can probably just align the edge of the paper to the edge of the wall. Whereas me? Well this is the barn that doesn’t have any straight walls. Even from this angle in a photo, it is blatantly obvious that my walls are not straight. In this case, there is about a 2cm difference from top to bottom. So there you go. Useful tip number 1 – use a plumb line. Now I’ve got my straight lines sorted I’m all set. Of course, I could probably have made my life a whole lot easier if I’d moved the furniture out of the room before attempting to hang wallpaper. But that was the weekend I had driven up overnight, unpacked a carload of stuff, and had to head back down the road to catch a plane to India. I didn’t have time to be moving furniture around as well. So now I’m all ready, time to start. Roll out a length of paper. Splodge a load of paste on it and stick it on the wall. Job done. But as I was opening the bucket of paste, a few words on the side of the container caught my eye. “Leave to soak….” What do you mean “leave to soak”? Leave what to soak? It’s paper. It will go all soggy if you soak it. Though I was right in one respect. When the paper has soaked up all the paste, it does become quite soggy and harder to handle as it tears quite easily. Strip number one went up OK. Strip number two was a bit more problematic – there was a double socket to get around. So what’s the proper way to deal with this? Turn off the power, remove the socket, paper over the box and then cut it out? Or cut a hole in the paper before putting it on the wall? I went for the latter option. By some amazing coincidence, the edge of the next strip of paper aligned to the edge of the socket. So I actually only had to find the right starting point and then cut 3 sides out of the edge of the paper. Which was all fine, until I actually came to hang it. Soggy paper tears quite easily. So although I’d managed to cut my hole out in the right place, as I was manipulating the paper into place, it tore slightly on one corner of the cutout. A few choice swear words were uttered. Don’t have time to cut another strip and do all that cutting out nonsense a gain. So I just manoeuvred it back into place and sort of brushed it together to hide the join. If anyone really wants to spend their time on their hands and knees trying to find the join, well hey, have fun. After that, well hey – I’ve got the hang of this now! Apologies to everyone who’s been missing my updates. Life has been a little bit on the hectic side just lately. Work (as in that nasty 9-5 stuff that pays the bills) has been a bit crazy. It’s silly season in the FS industry – as organisations start to worry about what their Half Year results are going to look like to the sharks in the City. So anybody who can count past 10 without removing shoes and socks is press-ganged into service to help come up with a good explanation of why the company is so good at spending money but not so good at making it. And believe me, a weekend of playing with numbers on a spreadsheet would not make for a very interesting blog. So I didn’t. Sorry! So after a horribly long week at work, I joined the madness of the Bank Holiday Getaway traffic, and spent 11 hours in the car overnight – finally arriving at the barn at 3am on Saturday. To be woken at 5.30am by the b***** dive-bombing birds and brilliant sunshine. Hey-ho. No rest for the wicked. Conscious that I had a lot to do and not much time, I got up and unpacked the car. It’s really quite remarkable how much stuff you can cram into the back of a hatchback…. Since the majority of this lot was clothes, I decided this might be a good time to finish off the dressing room. Last time I wrote about the dressing room, it was the trials and tribulations of manhandling a 3m length of worktop up the stairs. What I didn’t mention was that having coerced my Dad into putting up some battens for the last bit of worktop, I never actually got round to putting it up. (Attention span problems again – I got bored with the routing, so I couldn’t be bothered to cut and rout the last post that I needed.) So the worktop sat there on it’s side, trying to make me feel guilty every time I entered the room. But since I hadn’t actually put any clothes in there, it was easy to avoid. No longer. I have a whole car full of suitcases in need of a home. Time to focus the mind and get the room finished. At this point I have to say how relieved I am that Dad had already done the difficult bit. If I’d had to put the battens on the wall in my sleep-deprived state, they’d have been as straight as a politician’s expense sheet. Fortunately I just had to cut a post to the right height and route a couple of edges. So now it was time to unpack. And it has to be said, there is something utterly hedonistic about given a girl an empty 22ft x 14ft wardrobe…. But eventually there was order from all the chaos, and I now have a dressing room to enjoy. (Well, when I get a sofa in there, and perhaps a wine-rack, and an internet based whirligig clothes rail that picks out my outfits for me (No I haven’t been drinking, I really have seen it, and one day – if I can ever get more than a 0.0000000002 MGB broadband – I am going to get one)). So that was my weekend. A bit of carpentry and lots of unpacking. Cremating rabbits and other fun things to do at the weekend..
Before anyone gets on their phone to shop me to the RSPCA, they were already dead. I promise. I was just getting rid of the evidence. I got off an overnight plane in from India on Friday morning. Trekked across London to the wrong side of the river, dumped my suitcase, logged on to do an hour or so’s work and then headed out the door to City airport – where my flight up to Edinburgh was delayed by an hour. On the basis that nobody can really sleep on a plane, by the time I got home to the barn, I had been awake for 44 hours, and so had decided it was going to be a long lazy lie-in and a do-nothing day in the morning. The local wildlife decided otherwise. I was startled awake by an almighty bang and a loud screeching. I tried the old ‘head under the pillow’ trick to get back to sleep. But a couple of minutes later and it happened again. It seemed a couple of local ravens had taken offence to something they had seen in the house, and were suicidally dive-bombing the living room windows. The only thing that would stop them was me standing at the window in my PJ’s jumping up and down like a lunatic to scare them off. Well since I’ve been so rudely awakened, I might as well get up properly, particularly as it was promising to be a gloriously sunny weekend; such a rare event in Scotland it seems a shame to waste any of it. So I decided to do some gardening and happily spent a whole day weeding the front garden. I suppose I should point out here that the photo shows an area of about 8 m² that I have successfully cleared of weeds in one whole day. I am in denial about the state of the remaining 2½ acres that need clearing….. But all that fresh air, coupled with what now felt like chronic sleep depravation over the last few days, I decided I was definitely having a lie-in on Sunday. The local wildlife voted against. Again. It’s like living in a Hitchcock movie. The dive-bombing ravens returned at 5 am. I got up and did my bird-scaring routine, but this time I went back to bed afterwards. Peace perfect peace…… lasted for about half an hour and then the cows started. While I was pottering around in the garden on Saturday, entertainment was provided by the local farmers and the annual pilgrimage of the cows to the high pastures. They were being brought up two at a time and offloaded into the field above the barn. They were very clearly not happy about it and spent their time walking a circuit of the field, obviously trying to find a gap in the fences. Every time another two cows arrived, they changed direction and walked a circuit round the other way. All the while mooing madly. The grass in this field was clearly not greener! They eventually fell silent at about 8 pm. But then decided that 6 am on a Sunday morning was a good time to resume their bellowing. So my good deed for the day is to get it all cleared. Being one of those “Well I might need it one day…” sort of people, I tend to hoard stuff. Including building materials. At some point I will need to get another skip, but in the meantime, I have a cunning plan for disposing of the polystyrene insulation boards. I’ll move them all up to the rafters! It was while I was shifting them that I made my gruesome discovery. Underneath the polystyrene boards there appears to be a rabbits graveyard in my garage. I’m not sure whether they hopped in there of their own accord and got stuck and died of starvation. Or perhaps the insulation heaps were designated as the local old rabbits home, and all the corpses I found had just died of old age. Or maybe a predator had built himself a secret lair in the polystyrene and was snaffling rabbits as they hopped around my garden. Who knows? But it means that all that dust and dirt that had been covering me as I manhandled the insulation up the ladder was actually the mouldering particles of long dead rabbits. Ugh… not a thought that sat well with the breakfast bacon rolls. Not to mention the fact I was now left with a dozen or so dead bunnies to dispose of. I could be wrong but I think there might be a law against disposing of corpses in the wheelie bin. It traumatises the dustman, or some such nonsense. So how else do I get rid of a collection of dead rabbits? Well I could dig a mass grave. Except, as I think I might have mentioned before, my land is mostly rock. We don’t dig holes in the ground up here, we chisel them. And sorry if this comes as a disappointment but I am not blistering my hands to bits just to provide a dozen very long dead rabbits a decent funeral. Nothing else for it: Cremation! Still at least I could use the fire to clear a few other things as well. This is probably the tidiest my garage has ever been. And totally free of dead rabbits. So there you have it. Suicidal ravens, homesick cows and a graveyard full of rabbits in the garage. A perfectly normal, peaceful weekend in the country…. It has been nearly 15 years since I first bought the barn, an oversized animal shed with 2.5 acres of land. And I think it fair to say that 99% of my time has been spent worrying about the building not the land. There have been occasional, sporadic, attempts to plan a garden. Whenever the sun came out (which, let’s face it, is a fairly rare occurrence in Scotland) I would suddenly have an overwhelming urge to get outside rather than spend the day cooped up in a dusty old building site. I once spent a whole weekend building a circular rockery/rose garden right in the middle of the front garden, beautifully planted with ground roses and fuchsias. Unfortunately I hadn’t really thought it through. It lasted one flowering season – then a lorry load of cement turned up to bury the underfloor heating, and needing to get close enough to pump the screed in through the doors, drove straight over the nicely planted garden. They did at least have the sense to move the rocks out of the way, and some kind garden-minded concrete pourer replanted the fuchsia, but the roses were never seen again. But that’s pretty much it. In reality, apart from putting in the boundary fences, the borehole and the miles of pipe for the ground source heat pump, I haven’t really made much effort. In fact, it’s quite embarrassing to admit this, but until the Invaders from the South came up at Easter, I’d never actually walked through the half-acre of woodland I have out the back – it was an Easter egg hunt that finally got me in there! However, I think that is about to change. As I get ever closer to ‘finishing’ the inside of the house, I am starting to think a bit more about the outside and a couple of things have recently drawn my attention to the fact I’ve been ignoring my land. You may recall the blog a while ago about the gale force winds bringing part of one of my neighbours trees crashing down through all our fences. Well after that episode they decided to get the tree surgeons up, and the edict went forth that all three of these trees had to come down. It has left our landscape looking a bit bare and bleak, but apparently the central ash tree was rotten two-thirds of the way through; it wouldn’t have survived many more 90mph storms, and at 60ft high, would have taken out a large part of my barn as it went. So now my neighbours and I are discussing what we should plant instead. We may be remotely stuck up a hill with the next nearest house about a mile away, but somehow taking down these trees has felt like an invasion of privacy. So I got somebody up to talk about how and when I could get the solar power installed. While the GSHP is working well enough, it hasn’t really been tested through a proper Scottish Winter yet, so anything I can do to help to boost it is a pretty sensible thing to do..
From discussing the solar panels, we moved on to talking about a few plans I have for the garage, and while we were there, just happened to take a closer look at the gable end wall. I wish I hadn’t. I knew that some of the bricks in the wall were looking a bit the worse for wear, and that I needed to do something to get the downpipes to run right into the drains properly, but I didn’t realise quite how bad it had got. It is just water and weather damage. As rain seeps into the wall and then the temperature drops, the freezing water expands and, eventually, causes the bricks to explode. It is at least a double-skin wall. But when my helpful contractor chappy managed to get his hand all the way through the wall, I decided I didn’t want to see any more. I’ve sent him away to price up the job to fix the whole wall. Is it urgent? Am I worried? Well if this wall goes, it will bring down the steel lintel that runs right across the front of the garage to the boiler room. Which will in turn bring down the wall of the boiler room. So the boiler room roof will come down. Which will take out the heat pump and the main power cable and the water pipes…. No, of course I’m not worried. But I think it’s probably the first job I need to get done before I concentrate on the rest of the land. After that, who knows. As with the building of the barn, I do have a vision of what I want my grounds to look like, but just as it has taken me nearly 15 years to get the building how I want it, I suspect the garden is going to be another 15 years of effort. It feels like my tales of plumbing woes are endless on this blog, but this, I promise, is the very last one. Because it’s the very last room that needs any kind of plumbing. The Long Drop. I’m not entirely sure when it first got its name. It is a ridiculous room really, a metre long, a metre wide, and 4 metres high. Sitting in there feels a bit like having a loo at the bottom of a lift shaft. It has been sitting at the end of the corridor, neglected and ignored for quite a long time. Partly because there were plenty of other rooms to be getting on with, but partly because it is a room that has a few issues that I’ve been trying to avoid. Because of where it sits in the house, the walls up to the first 6ft or so are technically below ground. And when Mr Incompetent Builder built the retaining walls, he appears to have skimped a bit on the damp-proofing. Since this part of the house faces up the hill, it bears the brunt of the rainwater coming down. And the problem has been exacerbated by the foundations that were built for the conservatory on the cottage, that has acted like a giant concrete trough, collecting all the rainwater that poured out of the valley of the roof. (And let’s be honest, there’s no shortage of that in Scotland). With nowhere else to go, the water sat there, slowly seeping away through the cracks and under the building, straight down to the wall of the Long Drop. The resulting rising damp got so high it probably started to suffer from vertigo. With the recent construction of the conservatory, and gutters to take the rainwater from the valley away properly, the room does seem to have dried out, but it has retained that damp musty smell and feel, so I’m not entirely convinced the problem has gone away. The other reason for avoiding this room is my age-old phobia ‘the-fear-of-the-sound-of-running-water-in-a-barn.’ The cold water pipe into this room is the one that randomly and inexplicably exploded apart a while ago. Fortunately I was at home at the time so I managed to shut it down before too much damage was done. But even though the stopcock was replaced, and even though it hasn’t given me any trouble since, I am terrified of touching it again. Unfortunately, if I ever want this as a functioning loo, I can’t keep avoiding it. So this weekend I decided it was time to get it sorted. I’d already put some of the first fix pipes in place, and though they weren’t connected to the main water feed yet, all I need to do is put a loo in place, bolt a sink to the wall and connect up a few pipes. How hard can that be? I started with the loo. Since it’s a fairly bog -standard (sorry, couldn’t resist) loo, it’s not that hard to fit. Bolt a couple of plastic brackets to the floor and screw the pan in place. A bendy toilet waste connector and a bit of washing-up liquid, and the toilet is connected to the soil stack. My only slight irritation here is that Mr Incompetent builder has stuck the soil pipe so far out of the wall that he appears to have assumed that I want my toilet sitting in the middle of the room! Since the pipe comes out of a solid brick wall, not much I can do to change it. I’ll just have to build a false wall to hid the gap. Next job – install the sink. I shall gloss over the pain of drilling into engineering bricks with a blunt drill bit. Suffice to say I got there in the end – and I have the blisters on my palms to prove it. After that, fitting the tap was the easy bit. Next the waste pipe for the sink. Again, Mr Incompetent Builder’s handiwork seems to be designed to cause me hassle. Every other waste pipe that’s been installed in the house is 40mm. For some reason, this room got special treatment and he put a 50mm pipe in. So I had to trudge out to the nearest plumbing supplies shop to get an adaptor to fit. But when I got home I discovered that my newly purchased adaptor fitted the 50mm pipe, but the ‘adapted’ end of it didn’t fit the 40mm pipe I had. Of course, this probably wouldn’t be a problem if you had a complete design for the whole house and went out and bought all you’re pipes, joint and fittings in one go, like most sensible people would. But that kind of forward planning has never really been my style. I’m more of an adhoc, free-spirit kind of girl, with a very random approach to building a barn. I buy my materials in bits and pieces, as and when I decide to do something – and then curse quite a lot when it doesn’t all fit together. Still there is a degree of bendiness in plastic pipes, so with some strategically positioned supports (aka a bit of wood wedged under the pipe) and copious quantities of sealant I got the waste connected. I started with the hot water a) because it’s just one run to the hot tap so not too many connections that could go wrong, and b) because I’m too nervous about the previously exploding cold feed pipe to want to touch it just yet. I opened up the stopcock for the hot water and hared downstairs to check the results. Blissful silence. All the pipes appeared to be holding. I turned on the tap. Water came gushing out, just like it’s supposed to. See – how easy was that! I opened the plug to let it all drain away. Hmm, a couple of small drips coming out of the connection between the waste pipe and the trap. Minor issue. I can fix that no problem. So I disconnected the waste from the sink again, to see if I could nudge all the waste pipes into alignment. Needing to get rid of all the water that sitting in the bottom of the trap, I emptied it away into the sink. Er yes…. that will be the sink from which I had just removed said trap. So I poured water straight through hole in bottom of sink all over wood floor – a total muppet moment! The air turned briefly blue while I mopped it all up again. But a bit of re-alignment of my strategic bit of wood and generously applied sealant, and the refitted waste trap was leaking no more. So now I can’t put it off any longer. Time to open the cold water feed. But this time when I came back into the room there was a jet of water spraying out of the underneath of the cistern. Mad dash upstairs to turn the water off. Back downstairs to play the contortionist plumbers game, trying to get a spanner into the space under the cistern to tighten the connection. Upstairs again (fortunately it is only 6 steps up into the kitchen where the stopcocks are – I’m not having to dash across the whole length of the building), turn on water. Back downstairs….and this time I came down to hear the sound of the cistern filling. Well that’s OK then. All sorted right? When I checked the pipe fitting, it looked like I just hadn’t quite pushed it together enough. So I rammed pipe and joint together as hard as I could and went and turned the water back on. At last, blissful silence again. I appear to have a fully functioning WC. Woohoo!! By now it was too late to do any more, so I lit the fire, poured a G&T and chilled out for an hour or two for the remainder of the evening. Just before heading up to bed, I decided to check on my handiwork. Opening the door, all ready to admire my newly plumbed-in toilet, I found…… a fountain of water gushing up the walls. The same joint I’d had to fix before had separated again and the escaping water was rapidly creating an indoor swimming pool. Mad dash up the stairs to turn off the stopcock, throw a whole heap of towels on the floor and go to bed in a sulk. It was a fairly sleepless night; I kept waking up thinking I could hear water – even though I’d turned it all off – and when I did get to sleep, strangely enough, I dreamt I was drowning. This one seemed to work. So I could spend the rest of the day doing fun things like building the false walls to hide all that nasty pipework. But even though I’d spent the whole day in the room, and there had been no evidence that the pipes were about to explode on me again, I was still very nervous when I went to bed. I kept waking up and just laying there listening. I even got up at 3 am and went down to check. And then I woke up in a panic at 5am because I could hear the sound of water. I got all the way downstairs before I realised that actually it was raining outside, and that was what I’d heard. Well like I’ve said. When it comes to plumbing in this house, I am totally paranoid. But needlessly so in this case. I mean, OK, so it needs a bit of decoration, but I believe the Long Drop is now functional! Well the hole-blocking efforts of last week appear to have worked. This weekend I was not woken at silly o’clock by the frantic antics of a bird in the bedroom. I was woken instead by glorious sunlight streaming into the house. With the large house party that invaded at Easter, I finally had to bite the bullet and move into the master bedroom suite upstairs, complete with the madly-mosaiced bathroom and 20ft walk-in dressing room. To die for – right? Of course. But…. Of course, the minor problem is that in Scotland, by the time we get to the Summer solstice, it doesn’t really get properly dark that far North. And it is fully light again by about 3am. So I may not enjoy being woken with the light then! The other minor issue with finally moving my bed upstairs is the balustrade – or rather, the lack of one. I banned all visitors from the upstairs at Easter, as I didn’t really relish the idea of having to scrape anyone off the stone floor of the music room if they fell over the edge. But I haven’t really given it any thought on my own account. Admittedly to my knowledge I have never been prone to sleep-walking before. But you never know do you? With all the stress going on in my life right now I could well randomly decide to take a midnight wander without realising it…. So this weekend’s job is a Health & Safety one – get the balustrade put up in the bedroom. It’s the same concept as the one I put up in the kitchen – pre-grooved oak and glass. Just screw the base rail to the floor, put up a couple of posts either end and attach the top rail. How hard can that be? Well one or two minor differences to the one in the kitchen. To start with, unlike the kitchen balustrade which is only 1.5 metres, this beauty is over 4 metres wide. And secondly, where the opening in the kitchen is between two nice, normal, straight brick walls, the bedroom walls are stone – lumpy and solid. Not the easiest thing in the world to attach an oak post. I was also initially concerned about attaching the base rail, since it sits across the top of a steel lintel and I had a few nightmares wondering whether I could get self-tapping screws that would drill through steel. But actually I’ve decided not to bother. The rail actually sits on a solid wood floor that in turn sits on a chipboard floor. 2 inch screws every 10 inches or so for a whole 4 metres – believe me, that rail ain’t going anywhere! So next job is to fix the posts at either end. Well here I should thank my architect for his trendy ideas for the vaulted roof, which means there’s a very convenient roof truss right at the point where the balustrade starts. So on the assumption that the trusses are not going to move – because if they do it pretty much means my whole house is falling down – the top of the posts have been secured to the roof trusses. And the bottom of the posts can be fixed through aforementioned oak flooring and chipboard. And behind the plasterboard on one side of the balustrade is a fortuitously placed timber frame. So that just leaves one hole to be drilled into a granite stone wall then. Which is a bit lumpy, so to get the post to be properly vertical, I had to attack the wall with a hammer and chisel first! In the end, drilling into the granite was actually the easy bit! After that it was just a matter of making sure the top rail was level and that the grooves on the top were directly aligned to the grooves in the base rail.